John Bosserman was born in Bradford (OH) in 1926 and graduated from Toledo DeVilbiss High School in 1944 where he played trumpet in the high school band. After being drafted into the Army, he was placed in the 82nd Army Division Band in 1945 and 1946. Following his discharge from the service in 1946, he attended Valparaiso Technical School and The University of Cincinnati College Conservatory of Music for almost a year. While his goal was to become a professional symphony orchestra musician, but decided that his talent level was better suited for the field of electronics engineering. His fondest memories of that year at UCCCM was taking private trumpet lesions from Dr. Frank Simon, former soloist with the Sousa Band. He worked in the aerospace industry as a technician and engineer with Lockheed (California), Martian (Florida), and North American Aviation (Columbus). John married, had four children, and continued playing trumpet in several community bands over the years. In the early 1960s, he especially enjoyed playing trumpet in the the North American Aviation Band of Columbus, Ohio, where he met Sousa researcher Paul Bierley and had several long discussions about march music while Bierley was preparing to write his first book on the life of John Philip Sousa. John gave up playing trumpet and took a position in secondary education at Lancaster High School in 1964 teaching vocational electronics. He later taught science and diversified training co-op program for 30 years. He was head wrestling coach for 12 years. He hadn't thought about participating in any musical endeavor until he retired from education after 30 years experience in 1995. In 2000, Marcus Neiman conducted a Sousa style program with the Lancaster High School Band. John attended that concert and was highly motivated to start writing and recording marches. His first efforts were on his computer and he had six channels to record, so he started writing parts for clarinet, horn, trumpet, trombone, tuba, and percussion. He shared these tapes with Chad Geedey, who conducted the Reynoldsburg Community Band. Geedey encouraged John to write out the parts and indicated that he would have his band read them. John purchased composition software and, with his computer and keyboard, kept writing marches as a hobby during the next several years. 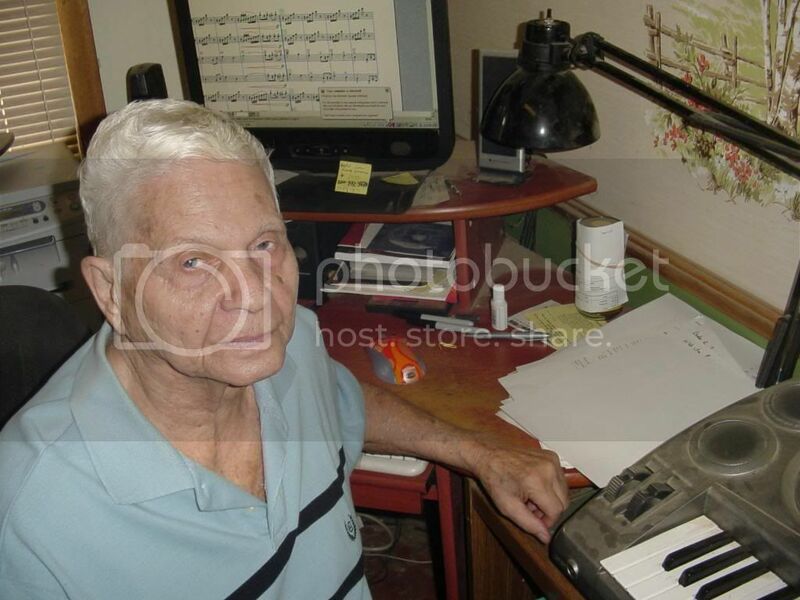 He soon started his own website (www.marchking.com) and enjoyed composing and arranging these marches. John ended up with over 60 scores before he decided to seek more serious direction in march arrangements. John again talked with Marcus Neiman and carried on extensive emails back and forth regarding the marches. Neiman encouraged John to continue to pursue his writing and offered revisions on a number of the marches. The two agreed that a series of marches should be recorded by The Sounds of Sousa Band with the possibility of making a complete march CD. At 82 years, John intends, as health dictates, to keep revising a number of the earlier marches suitable for recording and possible publication before attempting to write any new compositions. Since he no longer plays trumpet, learning more about writing a good march and hearing his marches played by a professional band makes a very worthwhile and exciting retirement pastime. Composer's comments: The music depicts the sights and sounds of Washington DC memorials and statues: Washington Monument, Jefferson Memorial, Lincoln Memorial, WWII and Viet Nam Memorials, US Marine Monument, Arlington Cemetery, etc. The trio is repeated twice; the first time it is written to provide a nostalgic feeling of historic events while the second time the same theme, with bass emphases, represents a more patriotic, flag waving, type of march music. The last theme gives the feeling of a mixture of all our memorial histories with one last eight bar conclusion bringing it all together in a forceful coda type ending. Composer's comments: After I retired from teaching, I still helped out with the wrestling program and I met this boy during his senior year and directed him to The University of Cincinnati (where I ended up getting my education degree). He became president of the Alpha Tau Omega Fraternity at the University while at University of Cincinnati and graduated sometime around 2004. The young man now works for ATO as a fundraiser all over the country. We still keep in contact quite often and have breakfast every time he gets back to Lancaster. I wrote the march with the school in mind. The first two themes reflect my feeling of college life, remembering the good times. The trio is supposed to sound like an alma mater song, in that style only; however, in a march tempo (played twice), the first soft and the second time fortissimo with a strong counter theme. The last strain should be the “rah rah” kind of football fight song. Composer's comments: This march was written to bring out the sights and sounds of the circus. The intro and first theme hopefully remind you of the rush as the circus begins and the clowns come running into the center of the ring, he second theme represents the trapeze acts as they swing on the bars above and walk the tight ropes. The trio depicts the parade of animals as the horses and trained cats come into the arena. The third repeat of the trio remands one of the elephants as they sway back and forth. The final theme was written to give the delightful feeling every kid gets as the circus comes to a close and all the participants and animals parade around the arena and leave memories of a fun day at the big top! Composer's comments: The march is a patriotic march. The first strain repeats and has a strong countermelody, which should be dominant. The second strain should sound like people waving flags as the band passes by. The trio is soft with a patriotic reflection of flag and country while the break strain might portray the more turbulent times the flag is represented during periods of conflict and war. After the break, there is a second trio theme which is later used in the last strain as a countermelody to the main first trio theme. That main theme is featured first in the final strain and on the repeat of the countermelody and should be of equal proportion so the main theme and counter theme are heard equally. Composer's comments: The composer found her as a story boxer dog about five or six years old in his front yard and attempted to find an owner, as all she had was the collar made by Hartz. That's how she got her name. Hartz is now deceased and the composer did have in mind the good times that they had together when he wrote the march. He suggests that you play it as a happy reflection of the personal feeling people get for their love of pets. He indicated that the first two quarter notes of the second strain in M2, M4, and M6, are supposed to be the barking! Composer's comments: This march was written with the Kings Island Amusement Park (near Cincinnati, OH) in mind. I have made a number of visits to the park. The first two strains represent the sounds of small combo bands parading throughout the park or merry-go-round music heard in the background. The trio depicts the exhilarating feeling one gets just walking around and mingling with the crowd. The break depicts the clanking sound as the coaster raises to the top of its first peak....then plunges down to the bottom. The flutes in the second trio remind one of the ups and downs during the rest of the ride. Composer's comments: He wrote this march for another wrestler who he started coaching in the seventh grade in the Lancaster Schools. The young man is now a Marine and asked “why don't you write a march for me!” The composer did. The march should sound patriotic. he break is to represent the chaos often experienced in a battle engagement. The second trio is the counter theme. After the second break, the march should be played in a grandioso style, with the main theme in the first 16 bars and the counter theme coming in for the last 16 bars to dominate. The composer comments that this is probably the most spontaneous march he ever tried writing. He saw the movie “Mr. Bean” during one of the holiday seasons and there was a British kid actor that reminded him of a student he know while teaching (the same one he commented about in the ATO march description). After the movie, he looked up the background of the actor and found pictures of his 12th birthday party. He stayed up half the night recording all the themes he used in the march and finished it in several days. The first theme is a take-off on a theme heard in the movie, only a couple bars, but sort of a grand introduction to the march. The second theme, he thinks, is the best of the entire march. He tried to depict a very, very, happy kid and thinks that he's done that. The trio, after the break, has a flute solo that of course is feathered, again supposed to represent that happy kid, and in the final trio the counter-theme once again should come through to make it a happy, enthusiastic type march. Composer's comments: This march is straight ahead. He wrote the trio first and it sounded like a polka, so he named it as such. There are two trio themes, the first played very softly the first time and in the final 16 bars of the march the two themes are played together and, hopefully, of equal importance, being heard together. He tried to get the first theme, when played the second time, to sound like an accordion. John Bosserman received an email from two members of the Great Seal of Ohio Band in Chillicothe, Ohio, who had frequented his website www.marchking.com and asked if it would be possible for him to compose a march for the occasion of the First Ohio Capital Festival held in Chillicothe in August 2008. John wrote the march as a tribute to the Chillicothe band and city and it was performed by the band during the festival. The march represents the sights and sounds of the early first capital building and modern city, including the surrounding hills and Great Seal of Ohio Mountain which is about 700 feet above the creek beds below. John especially like the last theme with a predominate counter melody. The first theme is characterized by a wide range of theme dynamics. On a trip back from Myrtle Beach the composer stopped to see one of his former high school wrestlers, Ethan Reeve, who has been the strength coach at Wake Forest University for the past nine years. He won an Ohio State championship in 1953 and later placed 3rd in the NCAA Nationals. After John's visit and tour of the strength facilities at Wake forest he wrote the march Deacon Power. The march contains elements of the Wake Forest school fight song as a counter melody during repeat of the trio section. The trio itself is patterned after an alma mater type melody while the last theme represents a standard rah rah football fight song.